10.000 years ago, give or take a few hundred, our neolithic ancestors were giving up their nomadic lifestyles and built the first permanent dwellings. One form of those early settlements didn’t have streets, houses were built wall to wall and accessed from the roof. New houses were often built on the ruins of the old ones, bringing each generation of buildings up higher than the one before and forming, over time, formidable artificial hills with many strata of habitation for todays archaeologists to uncover. As an archaelogical feature, these hills are usually called tell, from the Hebrew and Arab word for hill, but in Anatolia the Turkish word is used instead: höyük. The largest and best preserved site of this kind is found there: Çatalhöyük is estimated to have had about 10.000 inhabitants at its height and rose to about 20 meters above the plains. That’s approximately a modern six floor building – pretty impressive for a stone age culture that had been gone for 3.000 years when the Egyptians started building pyramids. But even back then, there was always rivalry. Someone always wanted the larger house higher up on the hill, with more ovens, more shrines and more cattle in the pen. That’s the premise of Höyük, where up to five players take control of a clan in such a höyük settlement and try to make it the most prosperous, most influential clan in town. And that means building the most houses, the highest houses and the houses with the most fancy furnishings. 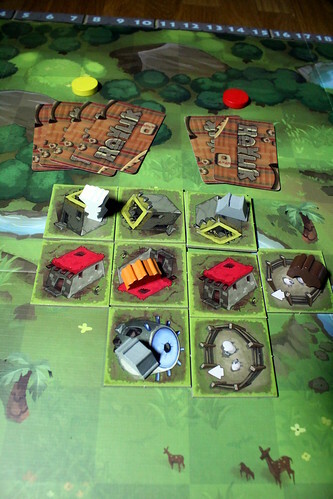 The rules for that are surprisingly simple: each round starts with two building phases where players draw a Construction Tile each and puts the depicted elements on the board. Those elements always include two houses and one other thing. Placing houses has a few, simple rules. You can always place a house anywhere on the board to start a new mound, called a block in the rules. You can also place a house in an existing block, but if you already have houses in that block your new house has to connect to them. Family likes to stick together. Finally, you can never connect two blocks, not even by a corner – if they started apart, they stay apart. You also have the option to build a house on top of one of your houses. You can only go up to the second floor, no higher, but that top floor will make a big difference when the time comes to count majorities. The other elements to be placed are even easier. Most tiles tell you what to place, but some give you a choice of two or even four different ones. The simplest features are ovens, shrines and villagers. When placing any of those, you take one of the corresponding meeples and place it in one of your houses. Animal pens are tiles just like houses, but with an additional restriction: they may never be completely surrounded by other tiles, you always need a way to get the cattle in and out. Cattle is yet another type of meeple and can be placed in the pens. It’s also one of the few points in Höyük where bad luck can mess with you, if you get cattle when you don’t have a free pen, you get nothing. The last element to place works different from the others. There is only one Shaman, and he only stays in the house he’s placed in for one round and protects the whole block from catastrophes. As soon as you have built some houses, nature comes to tear them down again. After the two Construction Phases, one catastrophe card is drawn. Most of these cards affect either the block(s) with the most or the least of an element: the most houses, the least ovens, and so on. In case of a tie, all tied blocks are affected. The effect of a catastrophe can be minor, like not being able to receive cards for the smallest block, but an earthquake might destroy half of each players’ houses in the largest block. That’s a bit more of a setback. If anything is left after the catastrophe – just kidding, something always remains standing – things get interesting: cards are awarded for majorities. For each block, one card is awarded for the owner of the most ovens, shrines, pens, houses, high houses, villagers and cattle. For everything but the most high houses, high houses act as a tie breaker. An important exemption from this are blocks that only have one player’s houses in them, they can never award any cards. You’re supposed to cooperate a little. The cards awarded are important because they are virtually the only way to score in Höyük. (You get a point for having the largest family in a block at the end of the game, but that’s neglectable compared to the points from cards.) Each card has the symbol of one of the game elements – house, oven, shrine, pen, cattle, family – and can be used in two ways. Either you play it to put one of that element on the board, or you play sets of cards with the same icon to score points. A set of five cards, the largest allowed, is worth 12 points, which is pretty nice.On top of that, a five card set lets you use your clan’s special ability to either put elements on the board or, in Red’s case, destroy an opponent’s house. Cards can be played at the start of each phase (Construction, Catastrophe, Counting and the Cleanup phase at the end of the round) and can cause a sudden shift in majorities just before the counting starts – if you don’t want to use that card for points instead. How you use those cards, and how many you get to use per round, is the driving force at the heart of the game. Each round, you may use one card for each block with your houses in it, meaning that you have to be in five blocks before you can even play the twelve point sets. That’s a very interesting dilemma right there: on the one hand, you want to have majorities in the existing blocks to get cards, but on the other hand you want to get more blocks going so you can play those cards. And then you still have to decide when a card is more valuable for points and when for its building. And it still doesn’t end there, because at the end of the round, you have to put the cards you played back. When the game starts, for each majority there is a pile of ten cards to draw from. At the end of each round, each player picks one of those piles to put all the cards he played under. If a pile runs out, then no cards can be earned through that majority any more and the pile can not be replenished, either. Once you run out of cards for ovens, for instance, then no cards can be won with the most ovens for the rest of the game. That makes the game very tight towards the end, players have to compete for fewer and fewer game elements in order to earn cards. And that’s not the only thing getting tight towards the end, space will run out at some point, too. 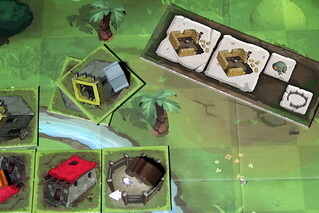 With the restriction that blocks may never be connected, the board can get full quickly, and you have many opportunities to lock your opponents in, making it impossible for them to develop their position in a block. Opportunities for that are obviously more available with more players, when space is more restricted already. That’s why I love the game with four players, but am not quite as enthusiastic with two. There’s simply too much space, and it’s much harder to lock your opponent in without help. Four is where things get interesting, playing in five is downright vicious. On a board that full, it’s hard to make a move near the end without stepping on someone feet. Fortunately, if that’s too intense for you, you can play with 20 houses per player instead of 25 and have some space to breath. 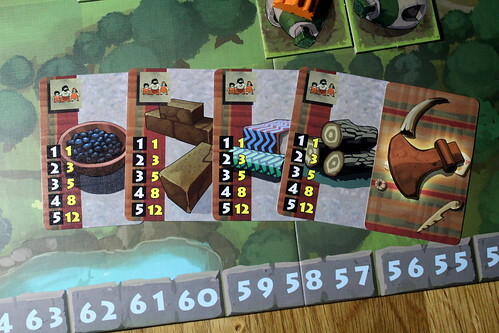 But lack of competition with fewer players is really the only thing I have to complain about in Höyük, with four or five it’s absolutely excellent. Quickly explained,played in about an hour and with interesting choices to be made on every turn. Different goals to consider for your strategy often pull you in opposite directions, but because each decision taken alone is small, this doesn’t slow down the game. You interact strongly with your opponents, and yes, you can really piss people off in this game. Sometimes that’s necessary to win. All that fun is then topped off with Mage Company’s high quality components, a very large game boards and many meeple style elements to put on the board: movens, shriples, the shameeple and even village meeple. It’s a wonderful game, and looks good, too. I definitely will play again. This review is based on a review copy given to us by the publisher Mage Company.